Lebanese food. In cities like London or New York, this cuisine has been a favourite of many for a long time now, but in Lisbon it’s still quite new! It might be because these are new tastes for my palate, or it might be that Lebanese food is great, period. Either way, Sumaya rocks my world every time I go there. 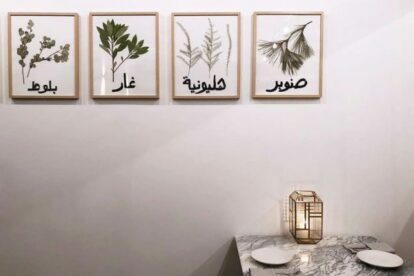 For starters, I love the way the menu is designed, taking us, customers, to often have a table full of different dishes, always passed around so that everyone can have a taste everything. Just like in Lebanon, they say. The interiors are also very interesting, starting from a room showing some traits of its building’s skeleton, and transitioning to a more modern room, with a very well decorated and minimalist feel to it. What has stolen my heart? The story it tells. A Lebanese grandmother who lives in Beirut, whose grandchildren live in Lisbon and cook her recipes to share what real Lebanese food is about.